Groin inflammation or adductor tendinopathy occurs when the adductor muscles in the groin can become inflamed, or degenerate through overuse. Symptoms include pain and stiffness at the top of the groin which can radiate down the leg. Treatment involves reducing pain and inflammation followed by stretching and strengthening exercises. Symptoms include groin pain which has developed gradually over time, where the patient cannot pinpoint a specific time or injury. Or, chronic, long term groin pain may have developed following an acute groin strain which failed to heal properly. Pain will likely be more severe at the top of the groin where the muscle inserts into the pelvis bone and could radiate downwards into the leg. Specific tests a professional therapist might do include resisted adduction, where the patient attempts to adduct the leg (pull it inwards) against resistance applied by a therapist. The squeeze test where the patient squeezes the therapists fist between their legs, may also reproduce symptoms and give the therapist an idea of muscle strength and any potential muscle weakness. Other signs include pain on resisted hip flexion (raising the thigh), and the patient will have difficulty running, especially sprinting or changing direction. There are five adductor or groin muscles in total. The pectineus, adductor brevis, and adductor longus originate from the pelvis and insert into the thigh bone and so are called short adductors. The gracilis and adductor magnus originate from the pelvis and insert into the inner knee, crossing both joints and so are known as the long adductor muscles. 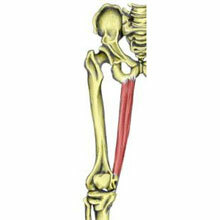 The main function of these muscles is to pull the legs together. from an abducted position, or in other words they pull the leg in towards the centre line of the body. There are also weaker hip flexors (lifting the thigh up) along with the more powerful iliopsoas muscles. The adductor muscles play an important role in sprinting, playing football, horse riding, hurdling and any sports involving fast, explosive changes of direction. Inflammation or more likely degeneration of the adductor tendons can occur through overuse or as a result of a previous injury such as a groin strain. The term adductor tendinopathy is probably a more accurate description of most injuries as it also describes degeneration of the tendon as opposed to specific acute inflammation. Acute inflammation is more likely to occur if the injury has flared up, or is recent. But long term chronic groin pain is most likely to be degeneration, without the presence of inflammatory cells. A professional therapist will aim to identify whether the groin pain is adductor muscle, iliopsoas muscle, abdominal wall (hernia), or pubic bone related as symptoms can often be similar or caused by a combination of issues. Tightness or stiffness in the groin area either during exercise, after exercise or the following morning, which is not relieved by stretching exercises. Loss of sprinting speed or the ability to accelerate. Reduced ability to kick a ball long distances. Discomfort in the groin area when decelerating. Rest is an important part of treatment, however, rest alone is not usually enough. Symptoms are likely to return once normal training is resumed unless a full rehabilitation program including massage and exercises is completed. It is essential that all exercises and training activities are done pain-free at all times during the rehabilitation process. Rest from activities which cause pain. Substitute other activities such as cycling, or complete rest until normal daily activities are pain-free. Apply cold therapy or ice for the first 24 to 48 hours to reduce pain and inflammation. When pain allows begin stretching and strengthening exercises before gradually returning to normal training levels. See a sports injury professional who can apply massage techniques advise on rehabilitation. A doctor may prescribe anti-inflammatory medication e.g. ibuprofen to reduce pain and inflammation. This may be effective in the early stages, but later after the acute phase, it may hinder recovery. A professional therapist may apply electrotherapy such as ultrasound or laser treatment to reduce symptoms. Ultrasound passes high-frequency sound waves into the tissues having a micro-massage and pain relieving effect. Laser applies energy into the tissue via a low energy laser beam. A professional therapist may apply deep tissue massage to the adductor muscles. Massage improves the overall condition of the muscle and in particular releases any tight knots, lumps and bumps which may be increasing the loads through the tendon, or be potential weak points where injury may occur in future. Acupuncture may also be used to relax muscles and improve muscle tone. All exercises should be done pain-free. If any pain is felt either during, after, or the following day then stop exercises, rest and take a step back before continuing. Gentle stretching exercises for the adductor muscles and iliopsoas muscles can begin. Short adductor stretch – groin stretches performed with bent knees will target the short groin muscles. Gently press down with the elbows onto the knees to increase the stretch. If it is painful then stop. A gentle stretch should be felt in the inner thigh and should not be painful. Relax into the stretch. 3 x hold for 10s, 1 x day and build to 2 x day. Straight leg groin stretch – keeping the leg straight targets the long adductor muscles that attach below the knee. Stand with your feet wide apart as shown, and lean away from the side you are stretching. Hold for 30 seconds and repeat 5 times a day. Changing the angle of the foot on the floor stretches different parts of the muscle. Seated groin stretch – can be done in a more relaxed way taking the load off the muscle whilst stretching. Hip flexors – although strictly not one of the groin stretches this exercise is still important. The adductor muscle assists in flexion of the hip (pulling the knee forwards and upwards). This will stretch the adductor muscles more specifically in the direction they are used for running. Assume the position as shown with one knee on the floor. Gently lean forward to increase the stretch. Hold for 30 seconds, repeat 5 times a day. Dynamic stretching – this should be done as the athlete returns to full activity. Dynamic stretching will stretch the muscle whilst it is moving and should be part of any warm-up prior to training. Gently swing the leg in a relaxed manner. It should not be forced. Forcing the muscle is ballistic stretching and can cause damage to the muscles. Aim for 10 swings on each leg, repeat 3 times a day. A good, relaxed swing is what is required, gradually increasing the height of swing. Strengthening exercises for recovery from groin pain should include specific exercises for the groin muscles as well as core strengthening exercises. Core strengthening exercises develop the muscles of the trunk and improve lower back and pelvic stability, which is important in recovering from long-standing groin pain. Read and view videos on core strengthening exercises. Isometric exercises – are usually the safest strengthening exercise to start within the early stages of rehabilitation as they do not involve movement but are static muscle contractions. They should be performed with legs bent and straight, and ideally, they should also be done with varying amounts of stretch on the muscles. Straight leg raise – this is a more advanced exercise. Sit upright with feet rotated outwards. Lift one leg slightly off the ground, move leg outwards whilst keeping off the ground. Return to the middle, then either rest for a couple of seconds, or if strong enough take the leg out again without resting. Aim for 3 sets of 10 repetitions daily. This exercise can be progressed further by performing it on a couch or bed with one leg relaxed down the side of the couch. Raise the leg upwards and across the other leg, lower and repeat 10 times. Build up to 3 sets of 10 then increase the resistance by adding a weight to the ankle. Eccentric adduction exercises are more advanced exercises which focus on strengthening the muscle whilst it lengthens rather than shortens as all the previous exercises have done. It is important to see how the muscle is the following day before over doing this exercise as eccentric exercise are more likely to produce muscle soreness. With the patient sitting down, legs out straight, the therapist slowly moves the leg out to the side and the patient resists the movement but not so much that the leg doesn’t move. This can be done very gently at first with the therapist increasing the resistance load and intensity over time. Hip adduction against gravity – there are three different ways of performing hip adduction exercises using gravity for resistance. In the first one, a chair is used and the lower leg raised towards the top one. Hold briefly then lower and repeat. Begin with 1 set of 10 reps building to 3 sets of 15 reps daily. Read more on groin exercises.